The Passerele Senghor is reminiscent of the Pont des Arts with its steel arches and wooden decks. It was completed in 1999, just after I took this photo. The bridge crosses the Seine on a single 106 m (348 ft) span. Passerelle means a small bridge and the Passerelle Senghor is a pedestrian bridge with a 15 m (49 ft) wide deck. The bridge is supported by two steel arch ribs joined by steel cross braces that support a second deck. The top deck has a rectangular opening that allows pedestrians walking along the quays to ascend from the bottom to the top deck. It was named after Leopold Sedar Senghor who was a French-educated Senegalese poet and politician. 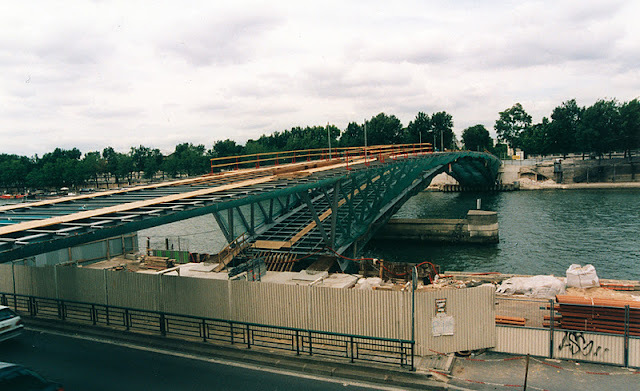 Seine River Bridges: Passerelle Senghor by Mark Yashinsky is licensed under a Creative Commons Attribution-NonCommercial-ShareAlike 3.0 United States License.